Walking body, (special arms that moved, heads turned as their legs moved to simulate walking) bendable legs, white walk 'n turn stand, Steffie head mold, brunette medium curled length hair, rooted eyelashes, blue eyes, gold lame evening top on white nylon gathered full skirt over white taffeta, silver lace crown, gold scepter, red cape with faux ermine trim, Miss America ribbon sash, bouquet of red roses, white shoes. Mail order only in late 1973. Markings: © 1967 Mattel, Inc. U.S. Pat. Pend. Taiwan. (This is the Quick curl face with painted lashes - but otherwise the face is the same) Kellogg's exclusive, same as #3200 but no white walking stand. Was shipped in a brown cardboard box by mail-order. Miss American 1972; Laurie Lea Schaefer promoted this offer. Brunette medium quick curl hair, Steffie head mold, painted eyelashes, blue eyes, twist waist, bendable legs, same attire as 3200, gold lame evening top on white nylon gathered full skirt over white taffeta, silver lace crown, gold scepter, red cape with faux ermine trim, Miss America ribbon sash, bouquet of red roses, white shoes, brush, comb, curlers, ribbons, rubber bands, and bobby pins. New blonde hair in 1974-76. Markings: © 1966 Mattel, Inc. U.S. & Foreign Patented Other Pat's. Pending Made in Taiwan. Kellogg's exclusive, brunette quick curl hair, Steffie head mold, painted eyelashes, blue eyes, twist waist, bendable legs, same clothes & accessories as #8697. Miss America 1973; Terry Ann Meeuwsen promoted this offer. 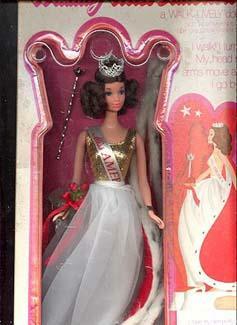 (When the Quick curl stock was depleted the 1972 Walk Lively doll was substituted). Markings: © 1966 Mattel, Inc. U.S. & Foreign Patented Other Pat's. Pending Made in Taiwan. Kellogg's exclusive, new blonde hair, rest same as 1973. 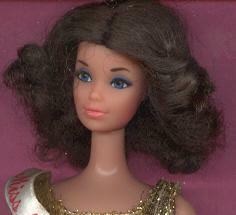 In 1974-75 the 8697 stock number, was used as this is the same doll, this exclusive offer expired on January 31, 1975. 3215 Royal Velvet (1972) - Miss American fashion; rose red long sleeve gown with faux fur trimmed neckline, white faux muff, fuchsia sheer nylon long slip with ruffled trim, chunky rose pilgrim closed toe heel shoes. 3216 Majestic Blue (1972) - Miss American fashion; sheer turquoise tiered sleeveless gown lined in silk, white faux short jacket with gold braid trim, white long tricot gloves, bouquet of five pink fabric roses with green tulle and Miss America ribbon banner, turquoise chunky pilgrim closed toe heel shoes. 3217 Regal Red (1972) - Miss America fashion; Reddish orange satin long gown with a gold knit sleeveless bodice, a gold belt with gold tone buckle, marching reddish satin short cape with real yellow fur trim, yellow tricot long gloves, gold textured plastic clutch purse, red square closed toe heel shoes.